This 2LP collector's picture disc edition of Out of the Blue was remastered from the original master tapes and includes a digital download of the album. Out of the Blue was released on October 3, 1977 and has gone on to be one of the most commercially successful album in ELO's history. It has been awarded a platinum record by the RIAA along with the group's album A New World Record. Only Discovery sold more and is double-platinum. The album was also the band's highest charting in the U.S., going to number 4. It produced two top twenty hits, Turn to Stone (1977 / #13) and Sweet Talkin' Woman (1978 / #17) but it is the upbeat Mr. Blue Sky that has become the signature song of the album and, in many ways, ELO's career. 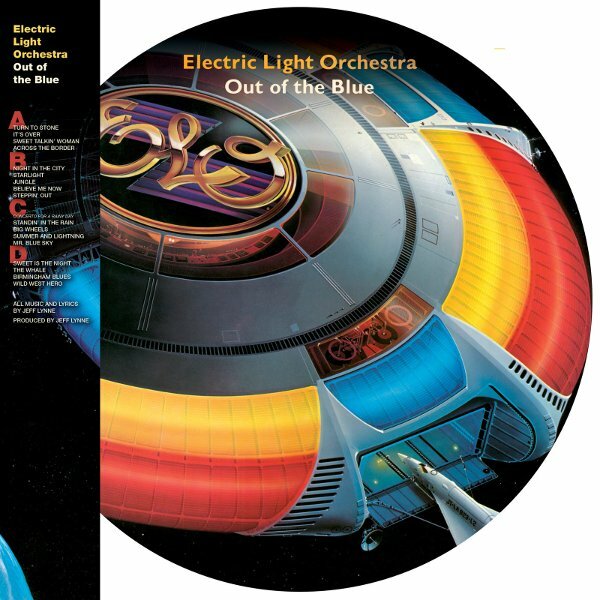 Blue Sky was not a big hit in its original release, only reaching number 35 in the U.S.
Out of the Blue was also the first ELO album to feature the group's logo as a three-dimensional flying saucer/space station, a visual motif central to ELO's live shows.